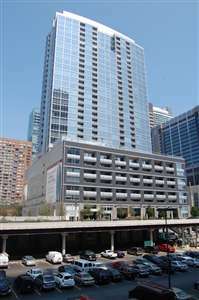 240 E. Illinois is a newer condo building in Streeterville and was completed in 2007. It is located at the corner of Illinois and Fairbanks but is accessible from “upper Illinois.” 240 E. Illinois is made up of lofts and of condos. Floors 3 through 8 are lofts and face south. They are pictured toward the bottom of the photograph. The remainder of the building is made up of condos which is in the “tower” portion of the building. Lofts typically sell for lower prices in 240 E. Illinois than their condo counterpart. This is mainly due to the layout, lower floors, use of space, etc. Lofts have recently been listed and sold in the mid $300’s for 1 Bedrooms with 2 Bedrooms fetching higher prices. While One Bed / One and a Half bath condos have sold in the very low 400’s or even slightly below, prices have rebounded in the building and currently the cheapest One Bedroom condos will be priced in the mid $400s. Square footage will runaround 1000sf. Overall these condos use the space well and most consist of a small office den or nook. Two Bedrooms will typically start around $650,000 and can be as high as $900,000 or more depending on square footage and floor height. The higher floor penthouse units not only have higher ceilings but higher grade finishes as well which will increase the price. In addition 9th floor units enjoy soaring ceilings as it is a transition floor between the lofts and the condos. Select 9th floor units have massive outdoor terraces. Two Bedroom square footage starts around 1300sf and moves up from there. Three Bedrooms at 240 E. Illinois will start in the mid $900’s. They are higher floor units and will have the best views in the building. From the top floors you do get some lake views but the city views and some river view is what is most beautiful. Square footage for Three Bedroom condos is over 1600sf. Located on the 9th Floor the building boasts a large gym, office space, club room, small outside pool and grass/garden area. The building also has 24hr door staff and a well appointed modern lobby. Your assessments at 240 E. Illinois include all the basics such as insurance, maintenance, amenities, etc. However it also includes Basic Cable TV, Heat, A/C and Cooking Gas. There are two condo associations in the building. One which oversees the tower and one which oversees the lofts. There is a 20% rental cap for the tower and at the current time I do not believe there is such a rental cap for the lofts but there has been “talk” about instituting one. While the building is dog friendly there is a 2 dog limit with only one being allowed over 40lbs. ← QUALITY OR SPACE IN CHICAGO? WHICH IS THE BETTER INVESTMENT?